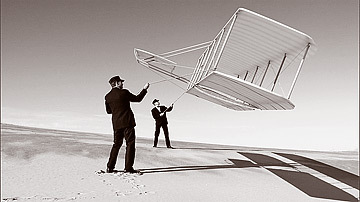 "On Great White Wings" a documentary on the Wright Brothers, will be screened at a "Digital Fiction" lecture. Visual effects designer Eric Hanson will present a free lecture based on his feature films work, "Digital Fiction: From the Wright Bros. to Apollo 15," from 7 to 8:30 p.m. next Wednesday at Kapiolani Community College. Hanson also will present two free workshops on the use of aerial-view satellite imagery and large Digital Elevation Model maps on Sept. 21 and 22. Hanson produces digital environments and effects for feature films. His credits include the films "Stealth," "The Day After Tomorrow," "Cast Away" and "The Fifth Element." His lecture will cover gigapixel photography and visual effects as used in a documentary on the Wright Brothers, "On Great White Wings," and on Tom Hank's IMAX feature about the Apollo moon landings, "Magnificent Desolation." The lecture will include a screening of "On Great White Wings." The lecture be in KCC's Ohia Building, Room 118. The workshops, 2 to 5 p.m. Sept. 21 and 9 a.m. to 4 p.m. Sept. 22, will involve creating a 3-D view of Oahu. They'll take place in KCC's Koa Building, Room 102. E-mail Sharon Sussman, ssussman@hawaii.edu.